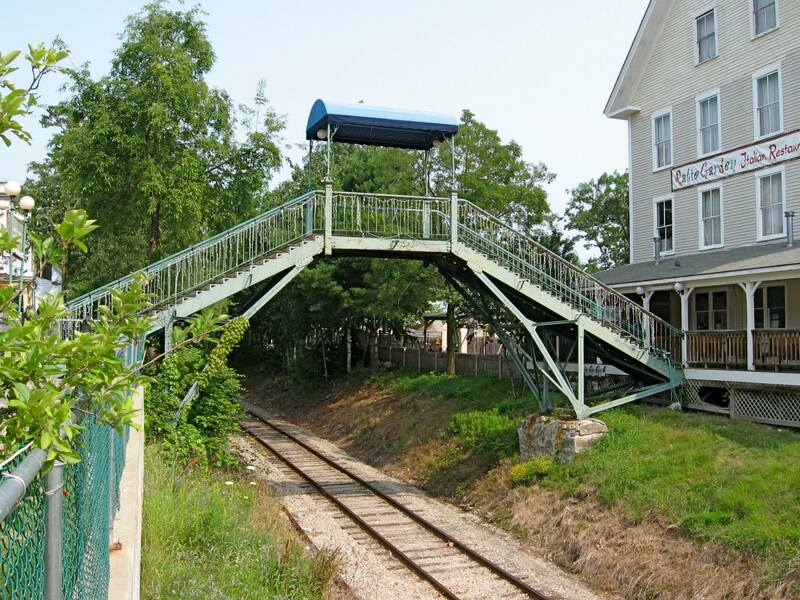 The next Mystery Bridge takes us to New Hampshire. We have read and heard of many stories of the Granite State losing dozens of historic bridges because of their being neglected by the local and state governments, including the Boscawen Bridge and this year the Sewall Falls Crossing. We’ve also read about the state priding themselves of their covered bridges, which are both loved and hated at the same time by many pontists. Yet this mystery bridge brings metal and wood together, not to mention the covered bridge and metal truss bridge lovers. Located over a railroad bridge along Lakeside Avenue between Tower Street and Foster Avenue in Weirs Beach in Belknap County, this bridge presents an unusual truss design that is almost never seen nowadays. 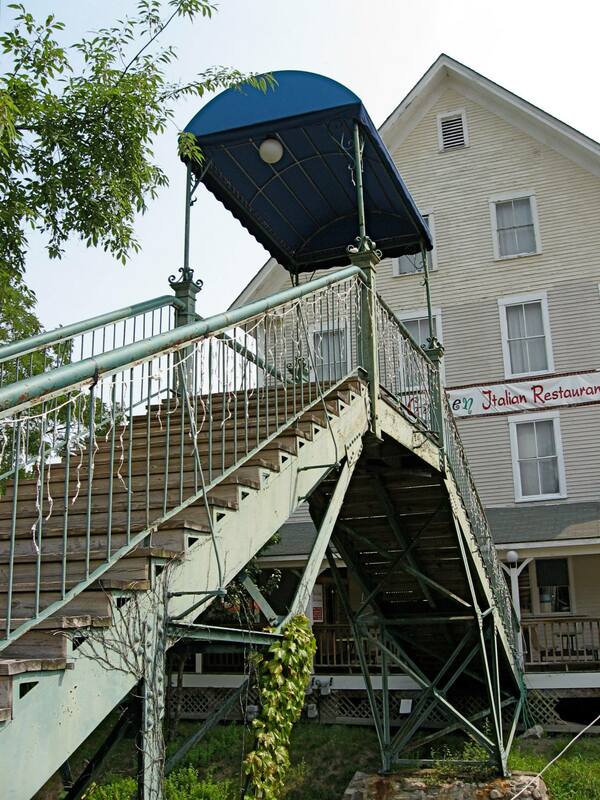 The bridge features a metal deck truss design in a shape of a Kingpost built on an incline. The outer portion has a 40° angle, whereas the inner portion has an obtruse triangular shape that is subdivided. Furthermore, the longest diagonal beam between the center span and the pier has a slight bent where the support beam meets. Looking at the trusses more closely, one can see that the connections are riveted, this putting the construction date up to the time after 1900, the time when riveted truss bridges were being introduced and proliferated with the standardization programs introduced by the states’ highway departments. The covered portion of the bridge in the center span features a pavillion with a half cylindrical roof colored in blue. The roof is supported by four iron piers, one in each corner and that are ornamental at the railing and where the columns meet the roof. The steps appear to be made of wood. 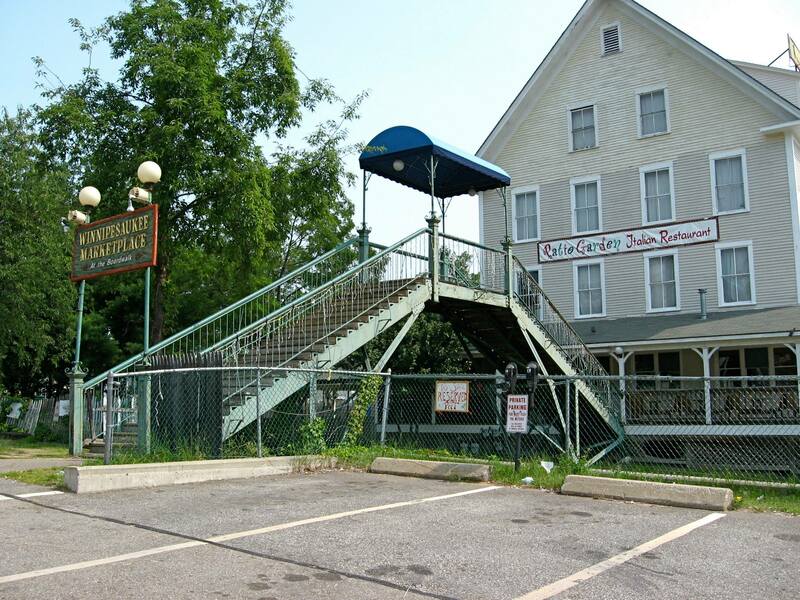 The bridge serves as the entrance to the Winnipesaukee Marketplace, yet it is unknown whether the bridge was built at the same time as the historic building, or if the bridge existed well before that. 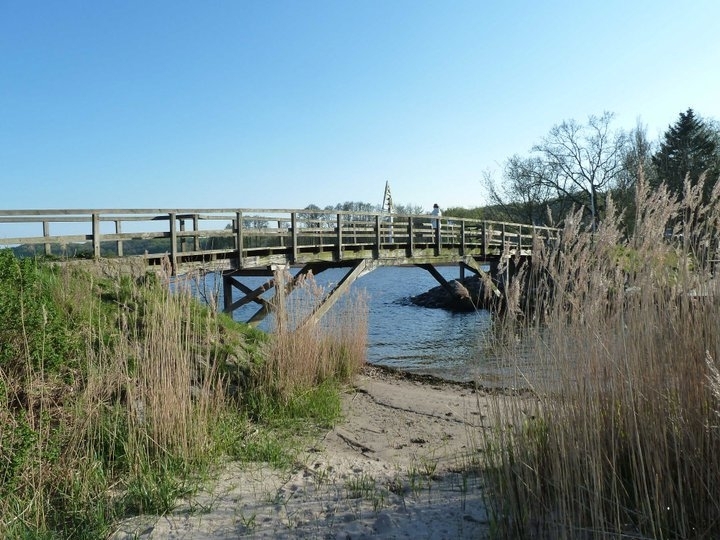 It is known that this bridge presents some similarities to another bridge in Germany, the Bridge of Friendship at the German-Danish border north of Flensburg, although the trusses for that bridge is not as advanced in appearance as this bridge at Weirs Beach. Plus the roadway of the bridge in Flensburg is straight, unlike the roadway of the New Hampshire bridge and its half-octagonal look. The Bridge of Friendship was built in 1920 and was renovated in 2004. This leads to the questions of when the bridge at Weirs Beach was constructed- whether it was at the same time as the market place or earlier- and who was the mastermind behind this unique bridge design. Why build it over the railroad tracks when trains passed through on a regular basis 60 years ago and why not build a tunnel underneath? These questions have yet to be solved. Can you help? 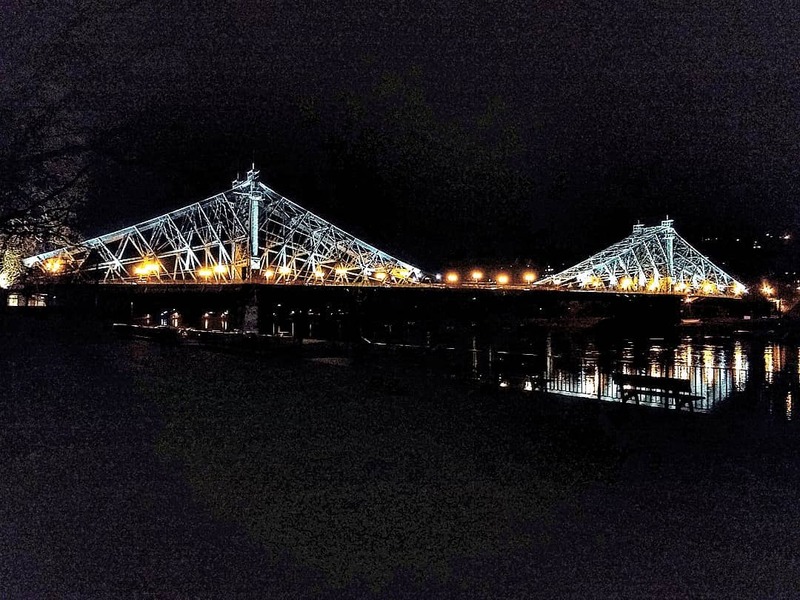 Post your thoughts in the comment section here, as well as those in the Chronicle’s facebook pages and the Bridges page, where you can see more photos of the bridge taken by Scott Wagner (who is to be thanked for allowing use of the pics). Your thoughts and stories/history behind the bridge will be much useful in solving this mystery. Know that bridge very well. Worked on the M/S Mount Washington which docked nearby. Bridge crosses over a scenic railroad the passed near the steamer dock. I live in Belknap County Jason, but do not have your answers – My guess would be that the railroad built it to appease whatever business formerly called the building in the background home.